The Anchor Portfolio is anticipated to produce over 5,600 kilograms of finished flower and over 550,000 grams of cannabis oil extract in 2018, targeted to grow to over 31,000 kilograms of finished flower and 3,100,000 grams annually by 2020³. ¹See “Definition and Reconciliation of Non-IFRS Measures” below. ²CSAC is currently seeking regulatory relief for one target whose 2016 data was lost due to the industry-wide issue involving a cannabis technology service provider in 2016, whereby the technology service provider suffered a complete data loss; it is anticipated that audits will be completed for years excluding 2016 for such Target Business. This relief cannot be assured. ³Subject to the completion of in place cultivation and product facility expansion plans, anticipated to come on line in 2019 and 2020, including relocating one dispensary, and assuming 2/3 capacity utilization of a new facility in 2020. TORONTO, Oct. 17, 2018 (GLOBE NEWSWIRE) — Cannabis Strategies Acquisition Corp. (NEO: CSA.A, CSA.WT, CSA.RT) (“CSAC”), a special purpose acquisition corporation, or SPAC, that listed in Canada on December 21, 2017, is pleased to announce that it has entered into definitive agreements (the “Definitive Agreements”) to concurrently acquire the target businesses of Washoe Wellness, LLC (“Washoe”), The Canopy NV, LLC (“Canopy”), Sira Naturals, Inc. (“Sira”), LivFree Wellness LLC (“LivFree”) and CannaPunch of Nevada LLC (collectively, the “Target Businesses” or the “Anchor Portfolio”), which are intended to constitute CSAC’s qualifying transaction (the “Transaction”). Following successful completion of the Transaction, CSAC plans to seek additional growth opportunities through synergy realization, organic growth, expansion of the existing Anchor Portfolio footprint, securing of new licenses and further acquisition activity. The revenue and Adjusted EBITDA¹ target ranges for 2019 and 2020 described below incorporate some but not all of the potential areas of future growth for CSAC. 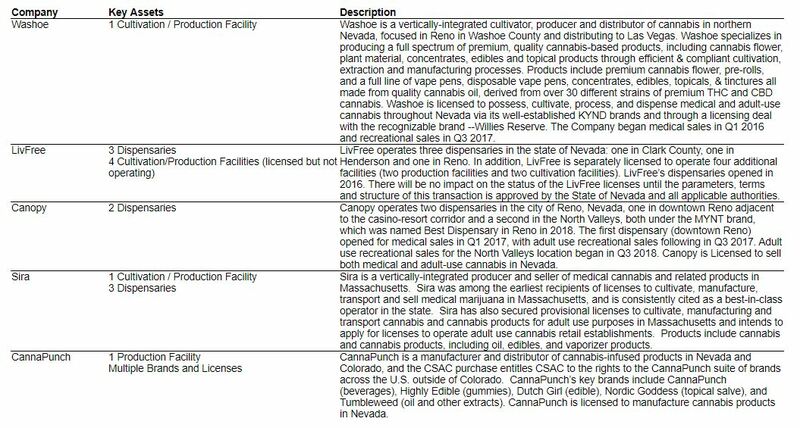 Washoe is a vertically-integrated cultivator, producer and distributor of cannabis in northern Nevada, focused in Reno in Washoe County and distributing to Las Vegas. Washoe specializes in producing a full spectrum of premium, quality cannabis-based products, including cannabis flower, plant material, concentrates, edibles and topical products through efficient & compliant cultivation, extraction and manufacturing processes. Products include premium cannabis flower, pre-rolls, and a full line of vape pens, disposable vape pens, concentrates, edibles, topicals, & tinctures all made from quality cannabis oil, derived from over 30 different strains of premium THC and CBD cannabis. Washoe is licensed to possess, cultivate, process, and dispense medical and adult-use cannabis throughout Nevada via its well-established KYND brands and through a licensing deal with the recognizable brand –Willies Reserve. The Company began medical sales in Q1 2016 and recreational sales in Q3 2017.